Guitar players are an interesting bunch, as our varied tastes in guitars can affirm. Many of us strive for eclecticism in our musical diversity that we hope comes across in our playing and songwriting. An often overlooked model in Fender’s line of guitars is the Jaguar, which Johnny Marr of The Smiths (notwithstanding his other endeavors) has used for decades to achieve chart-topping success worldwide. 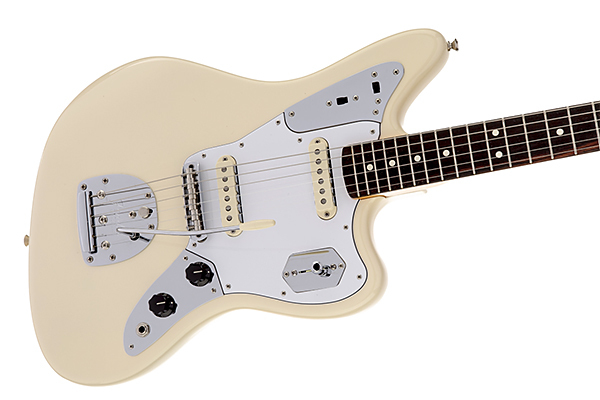 The Johnny Marr signature Jaguar is every bit a Jaguar, except… better! “But isn’t the whole point of the Jaguar to be a bit odd?” you may ask. Well, yes. Not every guitar is built to be a lightning fast, three-pickup, whammy-bar-from-hell shredder, and even if you are that guy, we still feel most guitar players can benefit from an instrument like this one in their collection. OVERALL RATING = 3.6 Stars, which earns it a WIHO Award! Fender Strats and Teles aside, the Jaguar has had production runs measured in decades since its inception in 1962. 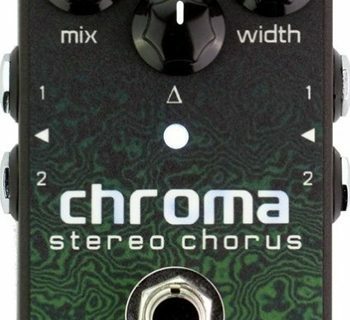 With many unique features, players looking for an instrument that is a bit different from the “me too” guitars of this iconic brand will benefit greatly from this instrument, which takes the classic instrument and upgrades it significantly under the hood, giving you all the mojo and tone of the iconic instrument, but in an instrument that a serious player would most likely prefer. Thanks, Johnny! You’ve truly improved upon this classic electric guitar. 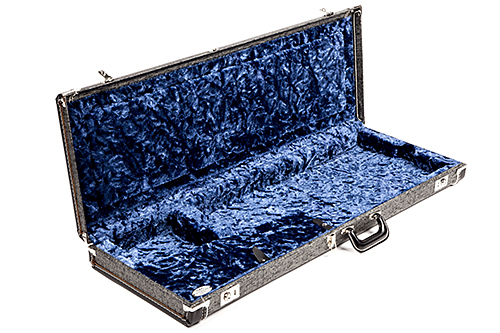 The Fender Johnny Marr Jaguar shipped in a deluxe Fender hard-shell case with a gorgeous blue, plush, velvet-like interior. Of course, our review is about the guitar, but there is something to be said about Fender’s ever-expanding assortment of case candy included with most of their pro-level instruments. All that was missing was a Tweed combo, but we can forgive the fact that those are sold separately. The guitar features a striking (in a good way) visual with the Jaguar’s offset body, short scale neck, and chrome-on-black appointments. We have raved before about how much we love a good nitrocellulose lacquer finish, and our Jaguar did not disappoint. We are starting to wonder if that smell can be used as girlfriend/wife repellant? Yes, another guitar for our collection. And we couldn’t hide it because the house now smells like it! The jet black paint was flawless, and there were no sloppy lines or smudges. Bimmer worthy. Arguably the most important feature that we will talk about much later on is the short, 24” scale length of the neck. To add to the aesthetic vibe, we also must call out the healthy sum of chrome on the guitar. The guitar’s bridge, tailpiece/tremolo, pickup selector switch plate, tone switch plate, and volume knob plate are all strikingly decked out. Twenty-two vintage-style frets with a 24” scale length makes for a shorter looking and feeling neck. Our guitar featured a beautiful flamed maple neck topped with a fair piece of rosewood. The radius is a steep 7.25”. The Johnny Marr Jaguar body itself is a little bit thinner than a stock Jaguar and takes modern day comfort and playability into account in its shape. The bridge and tremolo unit, like everything else on this guitar, was well thought out and an improvement over the stock instrument design. 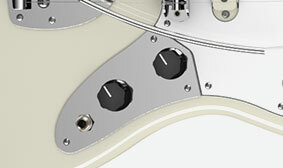 Traditional Jaguars of past have had well-documented stability problems, so one of the additions to this model are nylon bridge post inserts to improve stability, as well as the bridge featuring Fender Mustang saddles. 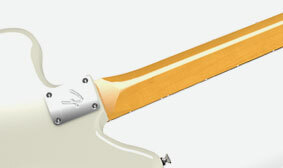 The tremolo system here includes an extra bushing, and the arm features the ability to stay exactly where you leave it. Tone switching on this guitar is also unique to this model, as one switch was removed from the stock Jaguar. 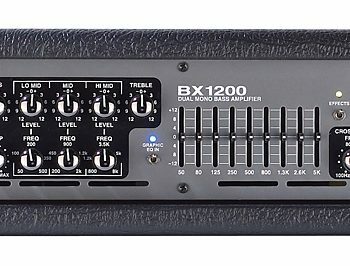 A master volume and master tone knob work in conjunction with a four-way selector switch. The switch gives us neck, bridge, neck and bridge parallel, and (interestingly) neck and bridge serial, which act like one big humbucker. Two bright switches near the upper horn of the guitar zero in on the tonal needs of the player. One is active through all four pickup positions, and the other is specifically tailored to position four. The Johnny Marr signature Jaguar is based upon a vintage 1965 Jaguar he owns and loves. Sadly, one of the vintage features that was preserved in this modern day, refined design is the heel-located truss rod adjustment. We would love to see a more modern adjustment that doesn’t involve removing the neck, like we encountered on the fantastic Fender Elite Stratocaster that we recently reviewed. Bare Knuckle supplies the pickups on this signature model, and they have been meticulously modeled after ‘62 Fender single coils. The pickups on the Johnny Marr are installed with the polarity in the same direction, enhancing string vibration and theoretically, sustain. Most guitars are plug-and-play, but taking that approach to this guitar will leave you with only half the usability of the instrument. 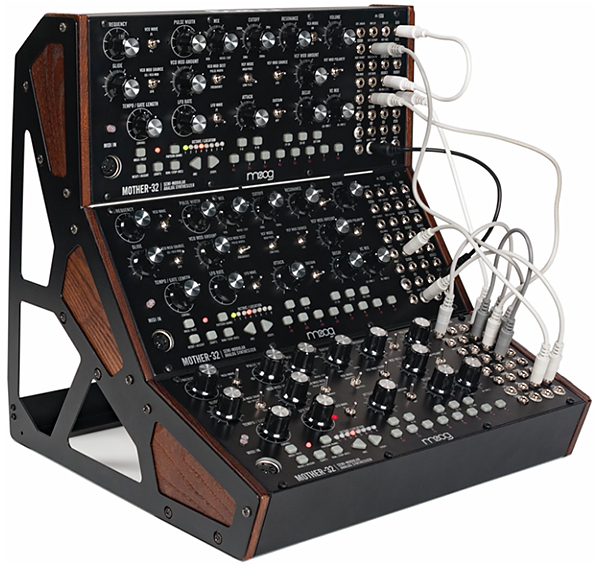 We really dove into the model-specific user’s manual and learned what the four-way selector switch and tone switches did before plugging in. 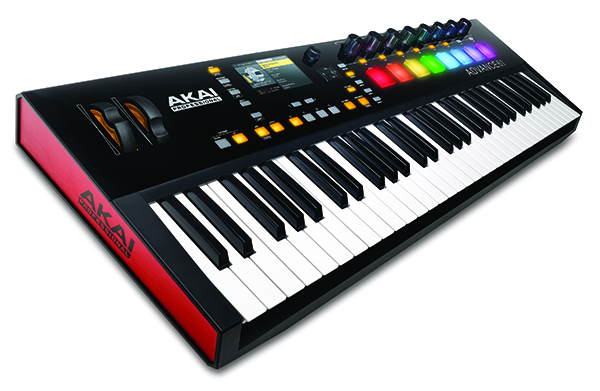 This proved beneficial in our sound tests later on, as without delving into the manual, we’d have been left not knowing how to get the best tonal options out of the instrument. More than with most guitars, RTFM is highly applicable here. We really loved the short scale of the guitar for a few different reasons: Soloing was fun, of course, as the short scale made things a bit easier in the lower positions. And the thick neck was comfortable to play, too, though not particularly optimal for players looking to shred on an atypical instrument. The only drawback we found to the short scale was when playing jazz style chords—things got a little cramped. The six in-line Fender tuners did a great job at keeping the guitar in tune through both standard and E flat tuning. Stability was dead on. If previous Jaguars had stability problems, this has certainly been corrected in the Johnny Marr Jaguar. The trem stayed in tune appreciably better than other period-correct tremolo systems we have on some older Fender instruments. 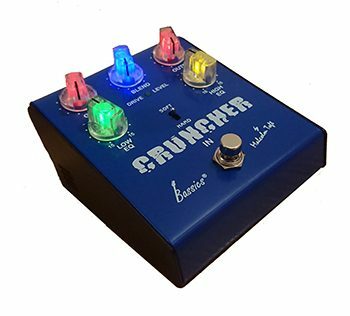 It is important to note, much like with other tremolo systems of the period, this is not a whammy bar for the dive-bomb crowd. A little shake and pulse give a nice chorusing effect, though, which is about the most you should expect from a ‘60s-design trem system. One unintended benefit of this guitar was how wonderful it was to use with our students. Many professional musicians also teach, and teaching often involves children with small hands. Although this is no student model guitar—nor are we recommending this as a starter instrument, it’s a wonderful thing to be able to throw a short scale guitar like this in the gig bag for lessons, then head off to rehearsal or a gig right after. We did this more than once during the review period. And of course… it makes for easier airline travel, too. When it comes to Usability, it’s important to note whether a guitar is up to the rigors of the road. With that in mind, we had the Jaguar out on a number of occasions during the review period. At one particular gig that will go down in infamy, we experienced a very unfortunate accident caused by a bar fight (maybe the presence of the Jaguar stirs up rowdiness?) in which a patron flew through a PA main, which came toppling down on our pedalboard (along with the patron). On its way down, the PA speaker knocked over a lighting bar, which in turn fell and landed on… the upper horn of the Jaguar. Ouch! Inspecting the guitar afterward revealed… not a scratch! Not a ding. Not a blemish. Nothing that could take the guitar out of mint condition. We don’t encourage you to perform similar tests on your instruments but suffice to say, we feel pretty good about the durability of this guitar. Our first sound test took place the day we received the instrument. We had a few students lined up, who looked at the new guitar wide-eyed. We keep our Fender Supersonic 1x12 combo at the school and plugged into the clean Vibrolux channel. We kept the high-pass switch engaged and the fourth-position high pass off for this sound test. We felt the second position, with both pickups in parallel, sounded best. It was well balanced in tone, and the guitar had a prominence to the upper air of the frequency band. The fourth position was clearly the most bass heavy, and it was a great sound. Using the fourth position, high-pass switch brought it right in line with the rest of the guitar. We have experienced similar features from Fender in the past, such as the neck pickup with no tone option on the AVRI ‘52 Tele reissue, used to comp bass lines in country western style music. We loved that our test instrument had a similar option, though achieved in a different manner. Switching to the gain channel on the Supersonic, we felt the guitar drove the amp better than anticipated. No, it didn’t quite drive it like a beefy, humbucker-equipped guitar, but our test guitar was hotter than many other single coils we’ve encountered. These Bareknuckle pickups were right in line with Fender’s previous custom shop offerings, and similar to our Fender Custom Shop ‘56 reissue Strat (which is our favorite single-coil guitar in our collection). There was some hum—which was anticipated, but nothing we couldn’t accept from a premium set of single-coil pickups. When playing a single-coil equipped guitar in a high-gain situation, you learn to work the volume knob. Our next sound test was probably the most fun we’ve had in a long time. None of us at MusicPlayers.com are spring chickens (except for the interns), and this writer is old enough to have and has actually gigged at CBGBs in NYC, the birthplace of punk rock and a frequent stomping ground of the Ramones. A Joey Ramone impersonator asked to sing “I Wanna Be Sedated” with our tribute band, and we happily obliged. We couldn’t pass up the opportunity to put down our main gigging guitar and play the Jaguar for this song. Thus, plugged into our Friedman SS100, the guitar sounded downright rude! It had just the right punk sound and feel to it. The low end has a color to it, with a great, open sound, and the pickups lost none of their articulation even with the gain cranked pretty hot. We liked the sound so much, we kept the guitar on long after the song finished and we resumed our ‘80s tribute set. We found soloing a bit more cumbersome than on our #1 shred machine, but the Jaguar isn’t about fast solos and flashy licks (though truth be told, Johnny Marr has unleased some fantastic, melodic solos throughout his catalog of work). If you want attitude and rebellion, though, Johnny Marr’s signature Jaguar is sure to make you smile. You’ll want this guitar. The Fender Johnny Marr Jaguar couldn’t have been documented better. It came with a manual specific to the guitar, which we would have been lost without. Electronics, accessories and hardware are warrantied for 1 year, and the body of the instrument is covered under Fender’s limited lifetime warranty. Fender also throws in a strap, a spare set of Fender strings, and a cable.